Pocket Tanks is a simple game and anyone can easily learn the basics of the game in few seconds. 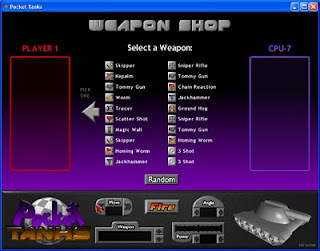 The game is a battle between two tanks that fire at one another with various cool missiles. Each missile has their special effects and power. Each tank gains score by hitting the opponent tank. The tank that has the higher score at the end of the game wins. It is a turn based game and the game ends if both of the tanks have no more weapons at their disposal. The weapons in pocket tanks can be categorized into three, namely, (1) weapon that cause destruction, (2) weapons that bury your opponent, and (3) weapon that remove the earth or terrain in the game. The first category is composed of missiles that cause damage to the enemy tank. The damage will come into the form of scores being added to your tank. My favorites in this category are the Chain Reaction, Pineapple, and Napalm for the great damage that they bring. Homing Missiles and the Heat Seeker hunts the enemy even if it not well targeted by your tank. The weapons in the second category include the Magic Wall, Dirtball, and the Dirt Slinger. The last two weapons are my favorites in this category because I use it to bury the enemy tanks. Burying the enemy tank is useful, especially if it has no weapons of category three. The enemy will be forced to incur damage when it tries to use category one weapons. Dirt mover and Earth Mover fall to category three. These weapons remove the earth that was used to bury the tank. Earth Mover, in particular, is also useful in clearing the terrain where the enemy tank is located so as to disorient the enemy when the position of your tank is already on target. The game is played by approximating the trajectory that should be used to hit the enemy tank. The trajectory is made by selecting the right angle of the trajectory and the power for your weapon. For the first salvo, I usually use the Homing Missile to gauge the angle I should use in hitting the enemy. Homing Missiles are no-miss weapons. After that, I pummel the enemy with various weapons so as to increase my score. Another technique that I use is hitting the enemy with Pile Driver. This weapon creates a pit where the enemy tank will fall, making it ideal for the Hailstorm weapon to create maximum damage. If the enemy has no weapon like the Earth Mover or Dirt Mover, then I use the Earth Pile and Dirt Ball to trap the enemy and make it damage itself with its own weapons. Pocket Tanks can be downloaded for free from Blitwise. The free version has no time limit for the play unlike the games downloaded from Popcap. The Pocket Tanks free version already has assorted weapons that can fill your boring time in office. If you are bored playing against the computer, then you can also play against your officemate via two – player or via LAN. The game can also be played via different difficulty levels, from level one up to ten. 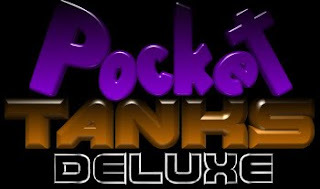 Pocket Tanks is developed by Blitwise. Full version is also available for purchase. The full version has additional 30 weapons that have more interesting and wacky effects. To download the free version or buy the full version, visit Blitwise now. Pocket Tanks is a nice game to play to while away time or to remove office boredom. The game is challenging enough to at least wake you up. Thinking of strategy and the best trajectory also makes your mind ticking. So if you are tired of Spider Solitaire or Minesweeper, then Pocket Tanks may be a good game for you. Visit Before the Eastern Sunset and read my post about the hotels that could be found in Mactan Island. You could download Pocket Tanks at the website of Blitwise. Hope you are enjoying Pocket Tanks.